Sami Sheinwald stood in front of her dinner table FaceTiming her mom, flipping the camera to proudly display the food-laden, friend-filled Rosh Hashana celebration. “Look mom, here’s mine,” Sheinwald said as she compared her spread to her mother’s table in New York. This year, Sheinwald, a junior studying nursing and women’s studies, hosted her own Rosh Hashana, or Jewish new year dinner, at her friend Josh Robertson’s house on Ward Street for twenty of their friends. Away from home and without a break from class, students who want to celebrate the holiday must step up and prepare the feast, or dine on free fare at the Hillel Jewish University Center. In the Jewish faith, the new year is a time for renewal, forgiveness and reflection. Rosh Hashana falls on the first day of Tishrei, the first month in the Jewish calendar, which does not line up with the Gregorian calendar since the Jewish year is longer than the secular year. The holiday begins at sundown and continues until sundown the next day. In Judaism, the day begins at dusk rather than at midnight, so all Jewish holidays start the night before their calendar marking. Rosh Hashana marks reaching the end of the Torah, the old testament, and starting it again. As the guests trickled in, they greeted each other with “Shanah Tovah” or “Good Year,” towing customary Jewish dishes with them. The friends enjoyed apples with honey, representing the sweet new year, as they sat on mismatched furniture and talked about classes, Greek life and their families. Sheinwald usually rings in the new year with brisket prepared by her grandfather, but chose to cook chicken and cornbread. Other people brought noodle kugel, potatoes, vegetables and shakshuka — a dish of poached eggs in tomato sauce. Robertson, a senior finance major, said the evening was a little more relaxed than what he’s used to at home. Yet he added that ambience­ wasn’t as important as the cultural connection between the students. A special moment for him was when all the nights’ attendees said prayers at the beginning of the meal, even though not all of them knew Hebrew. Sheinwald stood outside, listening to her friends chatter inside — and she began to tear up. “I said to Josh [Robertson], ‘Think of how little people we are, and look at what we’re doing right now,’” Sheinwald said. To help students feel comfortable during the High Holy Days, the period from Rosh Hashana until Yom Kippur — a holiday 10 days after the new year when Jews repent for their sins in the past year — Hillel and Chabad, two Jewish organizations on Pitt’s campus, host their own celebrations. 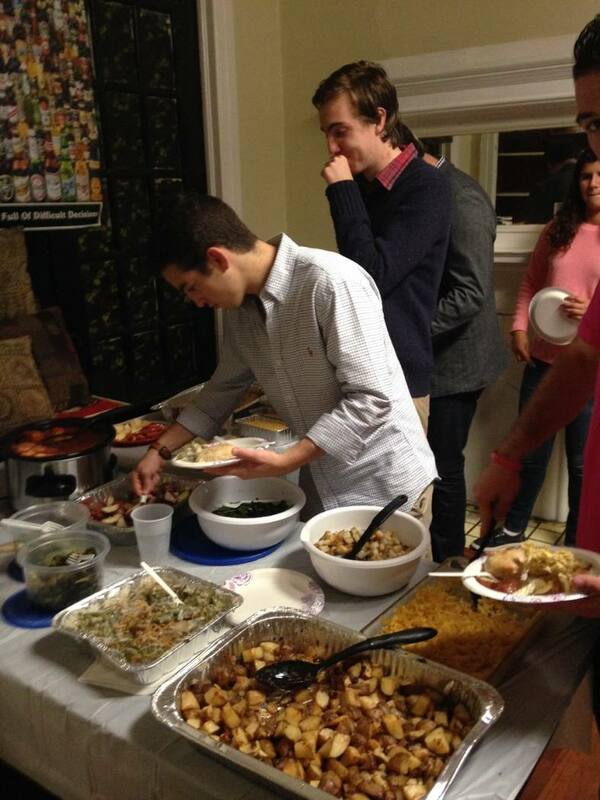 Hillel serves dinner at the Hillel Jewish University Center on Forbes Avenue while Chabad hosts dinner at an assigned house. After dinner, students walk in groups to different temples in the area to attend services. Each service begins and ends with a prayer and song session with a sermon in the middle of the ceremony. During the sermon, the rabbi imparts an important lesson for the congregation to carry with them to the new year. The lesson varies based on the rabbi and the context of the time. The rabbi will often find a way to connect the Torah’s teaching to current events and explain how the Torah’s lessons can still teach us today. Traditionally, Jewish people also attend services the next day, where they read the opening passage of the Torah. While many students attend these community dinners, some people would rather spend the holiday in the comfort of a familiar home. Sheinwald said several people thanked her for organizing the dinner. For Erica Schwartz, a junior nursing student who attended the dinner, the friends she spent Rosh Hashana with felt like family. “No one wants to feel alone,” Schwartz said. Schwartz said her family was having its own celebration at home in New Jersey, but Sheinwald’s dinner was “more college-friendly” and casual. “We had a lot of potatoes, not proper utensils, salad without dressing,” Schwartz said. Schwartz’s family dinner would be more formal, with a properly set table surrounded by family in suits and dresses, wearing kippahs, a traditional brim cap worn by Jews to satisfy the orthodox requirement of covering one’s head. For Sheinwald, hosting runs in her blood. She plans to continue hosting holiday dinners, just as her mother does.